How much distance from an immoral act is enough? That's the difficult question behind the next legal dispute over religion, birth control and the health law that is likely to be resolved by the Supreme Court. The justices on June 30 relieved businesses with religious objections of their obligation to pay for women's contraceptives among a range of preventive services the new law calls for in their health plans. 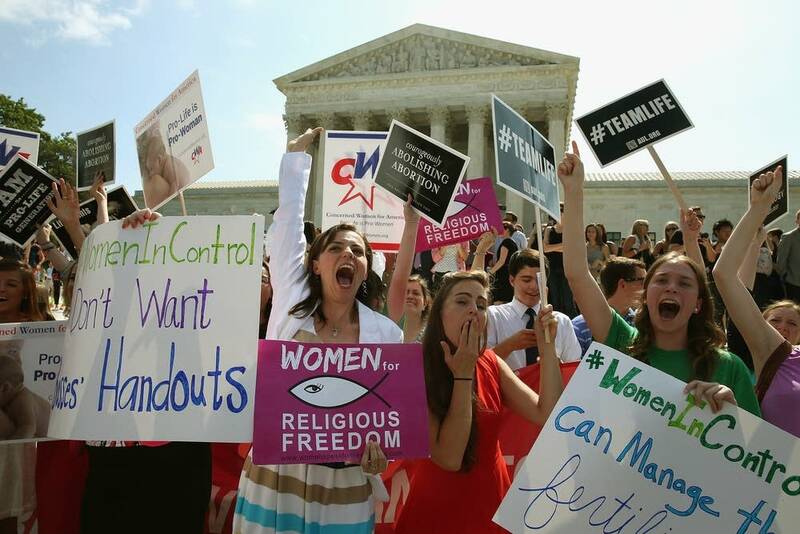 Religious-oriented nonprofit groups already could opt out of covering the contraceptives. But the organizations say the accommodation provided by the administration does not go far enough because, though they are not on the hook financially, they remain complicit in the provision of government-approved contraceptives to women covered by their plans. "Anything that forces unwilling religious believers to be part of the system is not going to pass the test," said Mark Rienzi, senior counsel for the Becket Fund for Religious Liberty, which represents many of the faith-affiliated nonprofits. Hobby Lobby Inc., winner of its Supreme Court case last month, also is a Becket Fund client. The high court will be asked to take on the issue in its term that begins in October. A challenge from the University of Notre Dame in South Bend, Indiana, probably will be the first case to reach the court. The Obama administration argues that the accommodation creates a generous moral and financial buffer between religious objectors and funding birth control. The nonprofit groups just have to raise their hands and say that paying for any or all of the 20 devices and methods approved by government regulators would violate their religious beliefs. To do so, they must fill out a government document known as Form 700 that enables their insurers or third-party administrators to take on the responsibility of paying for the birth control. The employer does not have to arrange the coverage or pay for it. Insurers get reimbursed by the government through credits against fees owed under other parts of the health law. The objections by religious nonprofits are rooted in teachings against facilitating sin. Roman Catholic bishops and other religious plaintiffs argue that filling out the government form that registers opposition to contraceptives, then sending the document to the insurer or third-party administrator, is akin to signing a permission slip to engage in evil. In the Hobby Lobby case, the justices rejected the government argument that there was no violation of conscience because the link between birth control coverage and the outcome the employer considers morally wrong was slight. Just hours after the Hobby Lobby decision, the 11th U.S. Circuit Court of Appeals in Atlanta granted a temporary reprieve to the Alabama-based Eternal Word Television Network. Judge William H. Pryor Jr. said in a separate opinion in that case that the administration "turns a blind eye to the undisputed evidence that delivering Form 700 would violate the Network's religious beliefs." But the Supreme Court could draw a distinction between subsidizing birth control and signing a document to deputize a third-party to do so, said Robin Fretwell Wilson, a family law specialist at the University of Illinois College of Law. "Think about how thinned down that objection is," Fretwell Wilson said. "The court might say that is a bridge too far." Judge Karen Nelson Moore of the 6th U.S. Circuit Court of Appeals in Cincinnati said the document is a reasonable way for objecting organizations to inform the insurer, but that the obligation to cover contraception is in the health law, not the form. "Self-certification allows the eligible organization to tell the insurance issuer and third-party administrator, 'We're excused from the new federal obligation relating to contraception,' and in turn, the government tells those insurance companies, 'But you're not,'" the judge wrote. People on both sides of this argument are looking to the Hobby Lobby case for clues about how the justices might come out in this next round. In a Supreme Court filing, the Justice Department said the outcome strongly suggested that the court would rule in its favor when considering the nonprofits' challenge. "The decision in Hobby Lobby rested on the premise that these accommodations 'achieve all of the Government's aims' underlying the preventive-health services coverage requirement 'while providing greater respect for religious liberty,'" the Justice Department wrote, quoting from Justice Samuel Alito's majority opinion. The legal filing was in opposition to an emergency plea from Wheaton College in Wheaton, Illinois, to avoid having to fill out Form 700. Wheaton is one of only a few nonprofits not to have won temporary relief in its court fight. Rienzi, who also represents Wheaton, wrote in reply that the government is wrong to assume that the Hobby Lobby decision "blessed the accommodation." He noted that Alito specifically said the court was not deciding whether the administration's workaround for nonprofits adequately addressed their concerns. On Thursday, the court, with three justices dissenting, allowed Wheaton to avoid using the form while its case remains on appeal. Instead, the college can send written notice of its objections directly to the Health and Human Services Department rather than the insurer or the third-party administrator. At the same time, the government can take steps to ensure that women covered by Wheaton's health plan can get emergency contraception the college won't pay for. Several legal experts said that perhaps a simple revision to the government document at the center of the dispute could resolve matters. "I think the question will come down to does the government really need them to tell the insurance companies or can you reword the form," said Marc Stern, a religious liberty specialist and general counsel for the American Jewish Committee. The faith-affiliated charities "might win a redrafting of the form. I don't think they can win an argument that says we can do absolutely nothing," Stern said.